Happy Monday! There’s a new challenge for you at Sweet Pea’s “One Sweet Challenge.” Our February theme is all about LOVE. 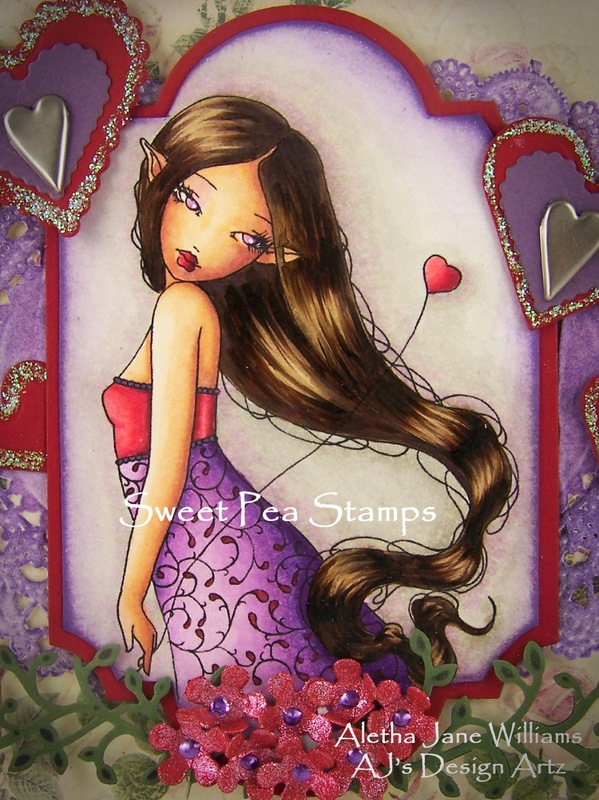 For my project I colored the beautiful image by Helena Reis, “Follow Your Heart.” This beauty is available in digital format or as a rubber stamp, a format for everyone. My “Follow Your Heart” is in the digital format. 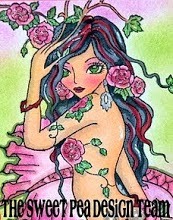 I have colored her with Copics and did some accenting with a red Spica pen. I then cut her with Spellbinder’s Labels 28. My layers of cardstock are from Stampin’ Up! in Cherry Cobbler and Perfect Plum. The designer paper is from Trimcraft’s Rose Garden collection. As you can see, I used several die cuts for this card. 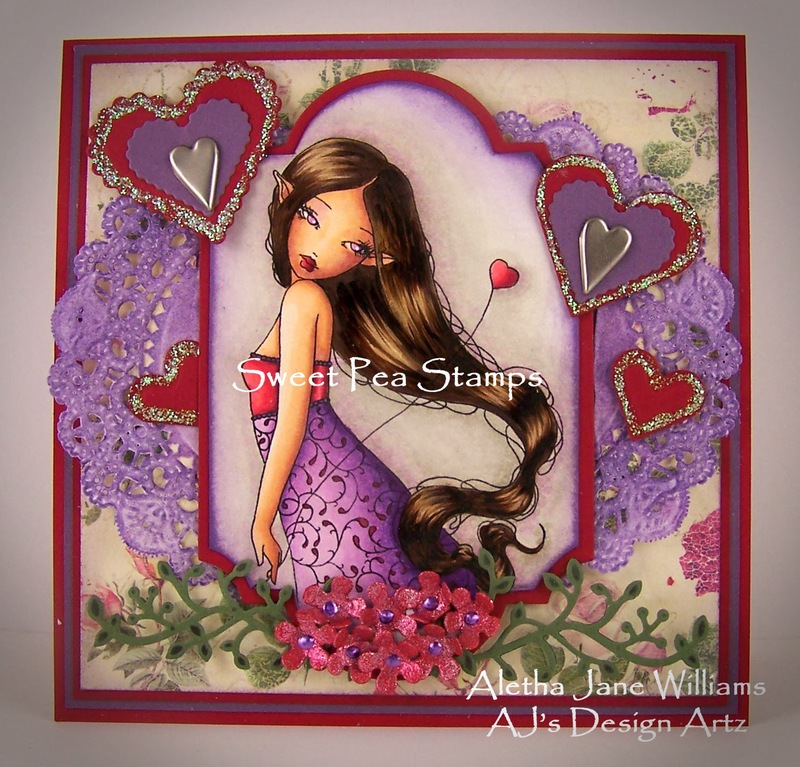 The hearts are die cuts from Spellbinder’s Classic Hearts and Classic ScallopedHearts. After I cut the hearts, I added Stickles and then found some heart brads. I have had these brads for years and have never used them. I just fell in love with brads again. ;o) Most of the background designer paper is covered with a doily that I added some Dusty Concord Distress Ink and then cut into halves. My little flower spray was created with Spellbinder’s Layered Scalloped Posy. I painted the posies with Carmen Red Viva Décor 3-D Stamp Paint. After that was dry I added some little drops of Orchid LiquidPearls. The vines were created with Spellbinders Die D-Lites Corner Sprigs. I cut the largest die in half and added Gathered Twigs Distress Ink to the embossed areas. Thanks for stopping by. If you have any questions, please contact me. I hope you have a wonderful and creative first week in February.